Nathan is our Financial Manager and has been with SERVPRO of NE Columbus since January 2012. He is responsible for all financial aspects of our business and is a vital part of operations..
Andrea is our Production Manager and has been with SERPVRO of NE Columbus for over 9 years. Andrea manages crews and jobs according to SERVPRO procedures. She is responsible for pretesting, scoping of services and job estimates. Her certifications include IICRC WTR, HST, FSRT & ASD. Subrogation I & II and is Lead Base Paint Certified. SERVPRO is proud to announce the promotion of Jarrod to Production Manager. Jarrod has been part of our SERVPRO of NE Columbus team since March 2015. As a Crew Chief is he responsible for production on fire, water, mold and bio-hazard jobs. Jarrod is IICRC WRT certified. Kevin is a construction Project Managers. His responsibilities include estimating construction projects and managing project until completed. Kevin has been with us since April, 2015 and is a Haag Certified Inspector. Heath is a construction Project Manager and joined our SERVPRO of NE Columbus team in April, 2015. He brings 26 years of experience in construction. Heath manages construction projects from estimating loss to completion and customer's satisfaction. Ken is our newest construction Project Manager. He joined our SERVPRO of NE Columbus team in April 2016. He has 20 years of experience in the construction field. Eight of those years were working on insurance claims. Zubair joined our SERVPRO NE Columbus team in April of 2016. He will be involved in business development in the mitigation and construction divisions. Zubair brings his knowledge and experience from working in the insurance industry. This experience will valuable estimating all types of projects. Jason has spent the past 20 years as an insurance adjuster in the Central Ohio area. We are very excited to have Jason join our SERVPRO of Northeast Columbus team as an estimator. The experience he has estimating all types of claims as an insurance adjuster will be a great asset to our SERVPRO team! Alexa is our Office Manager and has been with SERVPRO of NE Columbus for over 7 years and is a vital part of our team. Alexa is responsible for the office team delivering exceptional customer service. She is IICRC WRT certified. SERVPRO of Northeast Columbus welcomes Jeremy to our team as our sales manager. Jeremy retired from the Air Force after 21 years of service. His service was divided between 4 years active duty and 17 years in the National Guard. He has earned a bachelor’s degree from the University of Phoenix and a master's degree from Aspen University. We welcome Brittany to our Marketing Team at SERVPRO of NE Columbus. Brittany is a graduate of the University of Kentucky and majored in marketing and communications. She also has been work for an auto body shop as their social media manager. With her education and experience she will be a great asset to our team. Dave has been part of our SERVPRO of NE Columbus office administration team since September 2014. Dave's background was with a local retail store. His responsibility included management and training and was the executive assistant to the regional manager. He handles all the administrative details to process water damage claims. Dave is IICRC WRT certified. Rachel is part of the our SERVPRO of NE Columbus construction office team and is responsible for supporting several project managers with our repair jobs. 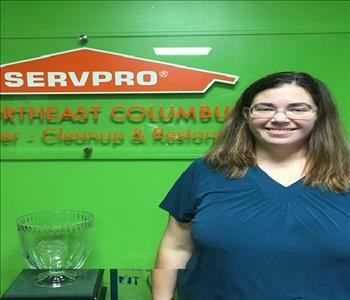 Rachel has been with SERVPRO of NE Columbus since February 2015. 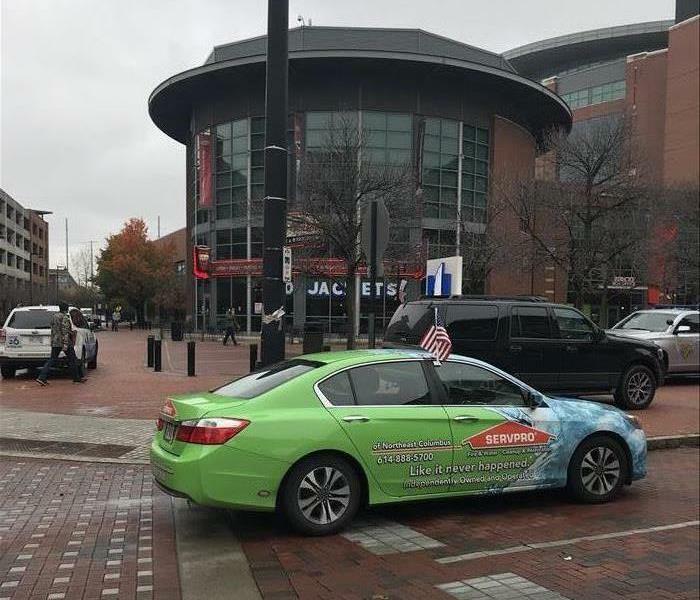 Jeanny has been with SERVPRO of NE Columbus for over 22 years and serves as a support for our marketing team, office and accounting departments. She has recently taken on our social media responsibilities. Christina joined our SERVPRO accounting team in December 2017. She was born and raised in Columbus and has 20 plus years’ experience in accounting. Accounts payable and receivable along with collections will be some of her responsibilities. Welcome to our SERVPRO NE Columbus team Christina! Emily joined our professional office staff as a claims coordinator. She will handling fire, water and mold claims from First Notice of Loss to completion of the claims. This is a demanding position and her experience with Nationwide Insurance will be a great asset in her new position. Welcome to our SERVPRO team! 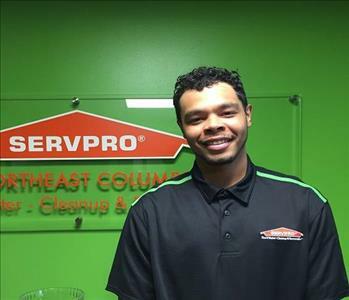 Thomas is a production assistant and has been with SERVPRO of NE Columbus since February, 2013. He has been a very dependable hand hard working crew member. 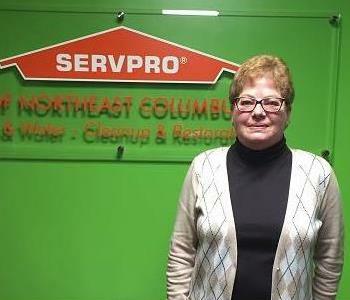 Certifications include Lead Base Paint certification and Subrogation I.
Patty has many duties at SERVPRO of NE Columbus. She is responsible for all our content boxed cleaning, completes pack outs and keep our office looking great.Patty has been part of our SERVPRO team for over 10 years. SERVPRO of Northeast Columbus welcomes Steve to our construction team. Steve has thirty years’ experience in the construction and restoration business. His dry wall and painting skills will be a great asset to our team. Zachary has joined our team as a production assistant. His background is in manufacturing and music. He earned a lead position which will be a great asset in working towards a crew chief positon at SERVPRO. Zachary has a positive attitude and will be a great asset to our SERVPRO team. Jim is responsible for monitoring our water damage claims making certain all materials have met their drying goals. Jim has been with SERVPRO of NE Columbus for over 10 years. Certifications include IICRC WRT, HST and CCT. He is also has Subrogation I & II and is Lead Base Paint Certified. Our construction team has added Doug as a new project manager with a wealth of experience. Doug brings 25 years of experience in the construction field which includes new home construction. He began with a small construction company where he learned the trade. Doug moved on to a large Central Ohio builder as an assistant and earn a position as a supervisor. While working full time Doug earned a degree in Business Management. SERVPRO is excited to have Doug on our team! We welcomed Jarrell to our SERVPRO team in December 2017. Jerrell’s background is in retail and warehouse operations. He will be working as a crew chief assistant to learn the SERVPRO business. Jarrell is a hard worker and eager to learn which will make him a great asset to our team. Derek join our SERVPRO team as a production assistant. He brings experience from work for another restoration company on the West Coast. With Derek’s great attitude he will be a great asset to our team. Rick start his construction career in his father’s business 25 years ago and can do most anything when is comes to home remolding. He has owned his own business remodeling homes and has flipped twelve homes over the years. He also has experience with another fire and restoration company in central Ohio. The great wealth of experience in the construction business makes Rick a valuable member of our SERVPRO Northeast Team. Doug joined out construction team this month and will be a great asset! He is an electrical engineer and has owned his own business for over 20 years. His ability to fix anything is his claim to fame. He also has work as a fire inspector to determine the origin of fires. Welcome Doug to our SERVPRO Team. SERVPRO of Northeast Columbus welcomes Sam to our production team. Sam is taking the WRT IICRC call in September and will be a Crew Chief. His experience was with Dicks Sporting Goods stores. His positive attitude and great work ethic will make Sam a great member of our team! We are excited to have Kaitlyn joined our marketing team! She is a graduate of Hanover college with a degree in communication and was an assistant director of admissions at Bluffton University. Kaitlyn will be a great asset to our SERVPRO team! Nathan has joined our SERVPRO production team as a production assistant. His experience was rehabbing homes and working at a specialty vegetable farm. He is eager to learn the SERVPRO business and move up to a Crew Chief position. Welcome Nathan! We are excited to welcome James Ortega to our SERVPRO team! James recently moved to Columbus, OH from California. He is working on our water and fire mitigation team and is working hard to learn the SERVPRO business. His positive attitude will be a great asset working while serving our customers. Shawn is the newest member of our office team as a claim coordinator. He has an extensive background in the insurance industry as an insurance agent and adjuster. Our claim coordinators are a very important part of our SERVPRO team, they are the key to great communication between our customer, adjuster and team members. Welcome Shawn!